We decided to have some fun and had a friend take a couple of pictures of the dogs and us. Picard hated the antlers so much that we put them on Tom instead. 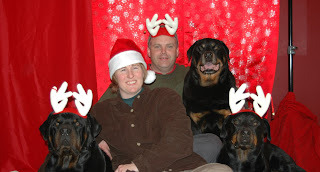 I think it’s a good look (: Notice how happy Picard looks because the other dogs had to wear antlers and he didn’t. Some of the advantages of being the senior dog.